Official historical records indicate that Buddhism first arrived in China during Eastern Han Emperor Ming's rule (57-75 CE). Emperor Ming saw a golden figure in dreams, and the next morning, he asked his ministers who it was. They surmised that the figure must have been the reputed Buddha from the west. Thus in 68 CE, the emperor sent Official Cai Yin from the capital, Luoyang, to the west. Three years later Cai Yin returned to Luoyang after journeying to India, bringing back with him Buddhist art and scriptures along with two Buddhist monks to preach in China. Soon after Cai Yin's return, a Buddhist community began to grow in Luoyang. About three hundred years later, rulers ordered the carving out and decoration of the caves today known as the Longmen Grottoes. Buddha at the Longmen Grottoes. 493-534 CE. Northern Wei Dynasty. Luoyang, China. Today, the Longmen Grottoes of Luoyang are one of the three most important Buddhist grottoes in China, along with the Mogao Caves of Dunhuang and the Yungang Grottoes of Datong. They tell a series of narratives arranged in chronological order. Though many historians mark Cai Yin's return from India as the official entrance of Buddhism into China, Chinese Buddhists prefer to emphasize that Buddhism appeared in China even earlier. Mogao Cave 323 at Dunhuang tells one such version of the origins of Chinese Buddhism. Cut in the Tang dynasty in the 7th century, Cave 323 is a product of a great increase in powerful Buddhist patronage by rulers such as Empress Wu Zetian and Emperor Wuzong. During this expansion in Chinese Buddhism, Buddhist historical paintings began to appear in places such as the Mogao Grottoes. 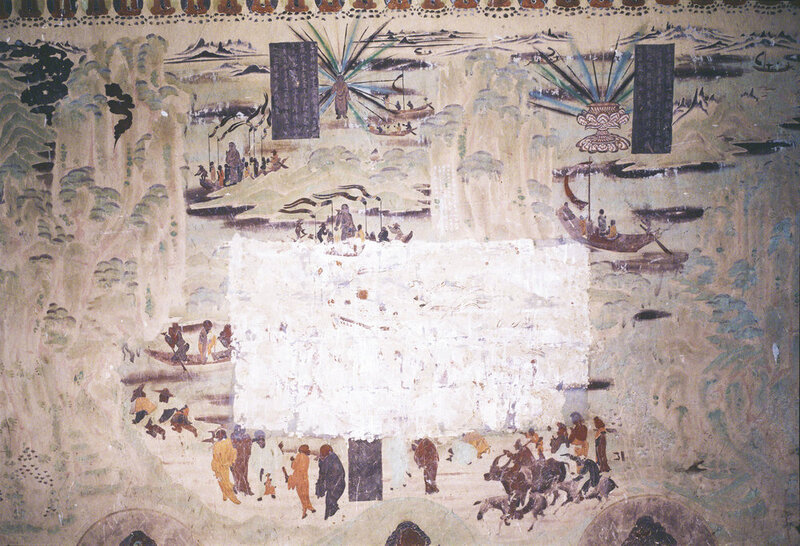 The north wall of Mogao Cave 323 depicts the story of diplomat Zhang Qian being dispatched to the Western Regions by Han Dynasty Emperor Wu (140-87 BCE). Historically, Emperor Wu sent Zhang Qian to the Western Regions as an imperial envoy in an attempt to form a political alliance to fight the Xiongnu. 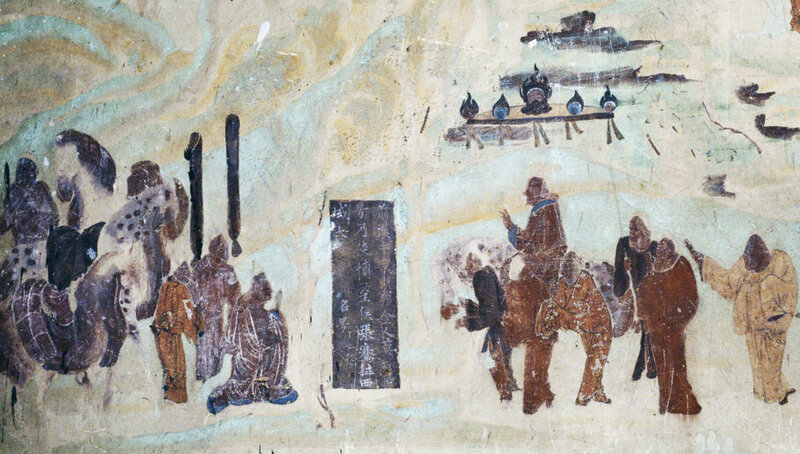 North wall fresco in Mogao Cave 323. Early Tang. Image Courtesy of the Dunhuang Academy. The mural on the north wall in Cave 323 references a legend that describes Emperor Wu worshipping two statues after winning a war against the Xiongnu. Delighted with his spoils of war and wanting to know more about the deities that the statues represented, Emperor Wu sent Zhang Qian to the Western Regions. Thus Zhang Qian journeyed to the west and returned to China with information that the statues were of the Buddha. Besides the legend of the metal statues, there exists another story about Emperor Wu's westward expansion. Following one of his military victories, Emperor Wu came into possession of a special breed of horse from Central Asia. 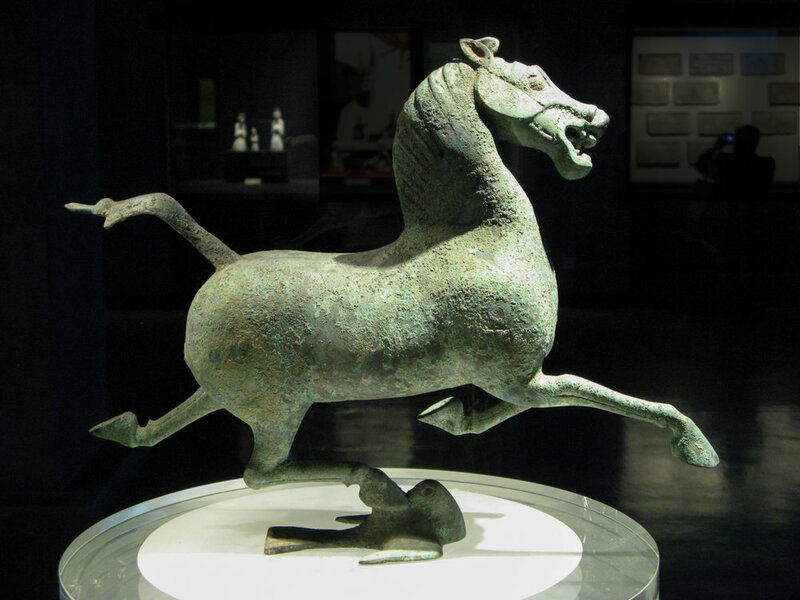 Heavenly Horse, 25-220 CE. China. Gansu Provincial Museum. Image by G41rn8 from Wiki Commons. And crossing the deserts all barbarians succumb in their wake! ― The Shiji, Ch. 24, "The Treatise on Music"
On your way to Dunhuang from Lanzhou, considering stopping by the Gansu Provincial Museum to take a peek at the Heavenly Horse from the West, otherwise known as the Flying Horse. Detail of Emperor Wu on a horse sending off Zhang Qian who is kneeling, north wall fresco in Mogao Cave 323. Early Tang. Image Courtesy of the Dunhuang Academy. Whether or not Zhang Qian ever journeyed to learn about Buddhism for Emperor Wu, he did go on at least one dangerous mission to the west that lasted twenty years. Although he never succeeded in forming a political alliance to combat the Xiongnu, his journey trailblazed a route for political, economic, and cultural exchange between China and the Western Regions. This passage that would completely reshape the history of world civilization became known as the Silk Road. Besides the Zhang Qian legend on the origins of Chinese Buddhism, the frescoes in Cave 323 depict other stories. Though not directly related to the two metal Buddha statues in Emperor Wu's possession, the fresco on the south wall of Cave 323 relates another early tale of Chinese Buddhism involving two statues. Two Stone Buddhas Floating on the River on the south wall of Mogao Cave 323. Tang Dynasty. Image courtesy of the Dunhuang Academy. In 323 CE, two stone statues were found floating in a river in southern China. When Daoists tried to welcome the statues, they were stopped by a storm. As depicted in this painting, when the Buddhists arrived, the weather became favorable and the statues approached the shore to be carried to town to be worshipped. Discovery of a Bronze Image of the Buddha on the south wall of Mogao Cave 323. Tang Dynasty. Image Courtesy of the Dunhuang Academy. In 326 CE, a bronze statue of the Buddha seated on a lotus was discovered in southeast China, in present-day Yangzhou. When townspeople placed the statue in an ox-cart to head towards town, the ox stopped in front of a monastery. According to the Sanskrit inscription on the back of the lotus, the statue was made by the fourth daughter of the great Indian king Asoka. Eight Men Ferrying a Statue of the Buddha from Mogao Cave 323. Tang. Dunhuang. Image Courtesy of Harvard Art Museums. 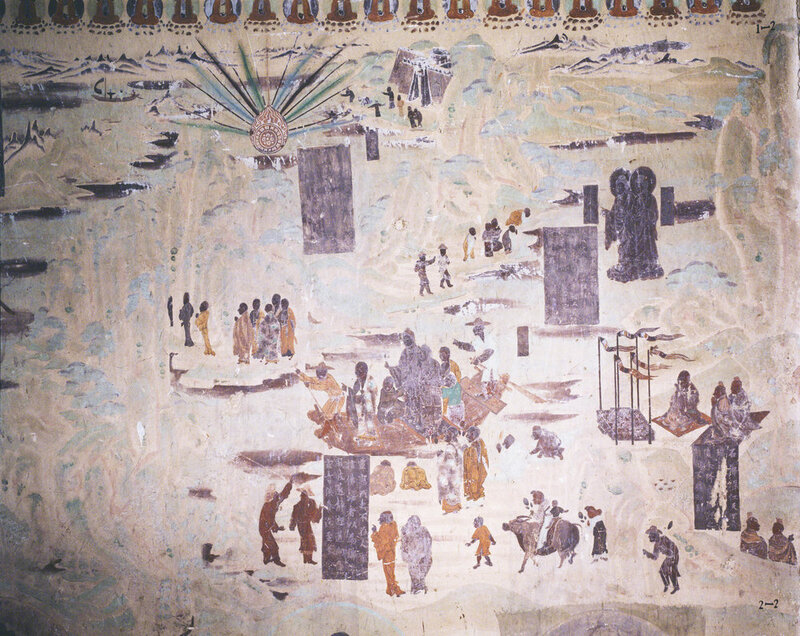 The center of the mural at Dunhuang depicting this scene was removed by American explorer and archaeologist Langdon Warner in 1924. It is now in the Sackler Collection at the Harvard Art Museums. Reconstruction of the Bronze Image of the Buddha Mural on the south wall of Mogao Cave 323, including the Harvard segment. Here is a reconstruction of how the section might have appeared in the original mural. Sui Dynasty Emperor Wen and Master Tan Yan on the south wall of Mogao Cave 323. Early Tang. Image Courtesy of the Dunhuang Academy. The Sui dynasty's first emperor, Emperor Wen (r. 581-604 CE), grew up in a Buddhist monastery and ruled as one of Buddhism's greatest public advocates. In this mural, Emperor Wen sits as a disciple in the center left with his palms pressed together, listening to the Master Tan Yan deliver a dharma talk, or a public discourse on Buddhism. Duan, Wenjie. Dunhuang Art: Through the Eyes of Duan Wenjie. New Delhi: Indira Gandhi national centre for the arts, 1994. 145. Sign up with your name and e-mail address to get the latest news and updates from the Foundation. Our deepest gratitude for your interest and continued support.